Drivers or secondmen pull up their diesels expertly in the dark — the cab interior is suddenly lit yellowish — and the cab door opens; two men holding flasks or sandwich boxes and metal-cased torches step out onto a brief wooden platform with steep staircases and banisters — like some hastily assembled gallows. The city footplate men and their guard take the train southbound while the rural crew take the other train back up northward and west, over the familiar route. Night driving, these northbound enginemen have full knowledge of the invisible road. There are no headlights on these diesels, so drivers move forward in a spectacular blindness through the starless dark, using trackside landmarks, platers’ huts or numbered bridges and viaducts to triangulate their location so the land exists in their minds more than to their senses. That ancient dark comes smothering close around the trains in the inhuman places. The rail spur line supplies author Alan Warner with both the title of The Deadman’s Pedal (literally, it is a bar plate that the engineman must keep depressed — if he lets up, say by dying, the engine immediately stops and the train comes to a halt) and one of his story lines. Running the trains between the Port terminus and Glasgow gives him the opportunity to describe that part of the Scottish landscape; keeping them running is a community of working-class, unionized under-achievers whom Warner takes some delight in bringing to life. 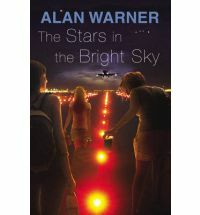 He does that through dialogue and that is one of Warner’s major strengths — his only previous novel that I have read, The Stars in the Bright Sky, was an excellent illustration of that talent which left me looking forward to this novel. Longlisted for the 2010 Booker Prize, it told the unlikely story of a collection of Scot’s lassies stranded at Gatwick Airport on their way to a girls’ getaway weekend. ‘Aye. Round and round your old man’s garage like the dodgems; you got up to over five mile an hour yet?’ Galbraith laughed and made the strange animal sound of his. Simon noted how big and loose the shoulders of Galbraith’s school blazer still were — bought for another year’s use yet. Indeed Nikki and Simon fancy each other, even though she lives in the council flats and he is the son of the town’s leading entrepreneur (his father now has ten lorries in his firm, competition for the struggling railway line). Simon has even taken Nikki up to the cave and promontory that is Simon and Galbraith’s secret hideaway. At the early stage in the novel where this conversation takes place, Warner has already used a flashback to introduce another element that will form his third story thread: more than a decade earlier the Queen herself came to the area to name Andrew Bultitude, master of the Broken Moan estate, as the Commander of the Pass. Simon has struck up a friendship with the son of ‘the doomed family’ and through him meets the intriguing, disturbed and attractive Varie Bultitude — he soon finds himself in a teenage love-torn conflict between lower class Nikki, her worldly sister Karen and the landed aristocrat Varie. Forbidding landscape, imprisoning class and painfully growing into maturity — those are the elements in which Warner grounds his story. Simon does decide to leave school and applies for a job as a Traction Trainee, thinking it is work at the hospital (you know, for people with broken legs) where Nikki’s older sister is a nurse but it turns out to be a train driver apprenticeship on the railway. He gets the job and, to his father’s dismay, becomes the sole member of a new generation in a working-class community of “waiting for retirement” railroaders. The Deadman’s Pedal is not a weighty novel — mainly it is the story of how Simon struggles to adapt to the conflicts that are inherent in each of those three story threads. Warner uses that structure to develop a series of set pieces and, to his credit, delivers on most of them. The result is not so much a coming-of-age story as it is a series of observations, viewed through a young man’s eyes, on a world that time has temporarily left behind — rest assured, reality intrudes as the book moves along. Reviews elsewhere had touted The Deadman’s Pedal as a candidate for this year’s Booker longlist; I picked it up on that basis, coupled with a grudging appreciation of The Stars in the Bright Sky, a novel that succeeded more often that it failed. I have known a few train engineers in my time, so that aspect interested me (and I wasn’t disappointed with that thread). The novel didn’t make the longlist and I can’t say I am surprised — despite that, it was a worthwhile read. Warner creates an interesting cast of very human characters and does a good job of portraying the isolated community that is their world — The Deadman’s Pedal may not be an ambitious novel, but it is a successful one. Had I been Alan Warner’s editor, I am pretty sure that I would have gone to the mat in demanding that this book be titled Departure Lounge. And that the entire marketing budget be devoted to ensuring major displays in every airport bookstore in the English-speaking world. I am certain the commercial success would have been enormous, although one side effect would probably be that the novel would not have made the Booker longlist. The Stars in the Bright Sky is the story of six young women in their twenties who have arrived at Gatwick Airport ready for a holiday — destination to be determined by the best last-minute, online bargain that is available. Five of them went to school together in Scotland and remain “friends”; the sixth is a stylish, posh English roommate of the member of the group now residing in London — she brings the mystery and suspicion that are necessary to put some tension into the sixsome. All of the action takes place in and around Gatwick, hence my title. Suspicious Manda, calm Kay, fascinated Kylah and timid Chell sat alongside one another on the staunchly commandeered back seat of the Hotel Hoppa minibus; other passengers seated in front of them were also looking out, glancing upward at the circular, elevated traffic lanes. Among all this gloom, the minibus windows seemed dirty, perhaps even tinted, yet the outside entire — those night airs — was dusted with a particular light above each sodium lamp and just below every car park floodlight; a spectral grittiness haloed vehicle tail lamps on the limited feeder lanes where cars and mysterious white vans appeared with an unbound continuity. Manda is the ignorant traveller from hell (I am pretty sure you can find a version of her in the bar or departure lounge of any international airport). She never stops loudly declaiming her thoughts, none of which have any value. Back home, she is a Practice Manager in her sister’s salon, so she regularly critiques the makeup, nail polish and shaved/waxed legs of anyone in sight. She’s also a regular at Rascals, the new “club” in the village (to which she frequently texts thoughts, to keep the other regulars up to date on her progress). She also is a single mother, accent on the single, but does keep checking back on wee Sean. Warner makes it clear that she will never leave the village — it is as big a world as she can ever be expected to handle — so this holiday package trip, wherever it ends up, is Manda’s version of life-expanding experience. Some of the girls, especially Manda, were disillusioned that, as they entered the Flight Deck Hotel bar, more heads did not turn to them. Finn and Ava were now accustomed to the general anonymity and nonchalance of great cities — the curtailed glance on entering an establishment had replaced the shameless but acceptable scrutiny of their home places. In their village and small town, Ava and Finn were scrutinised for hopefull signs of incipient dissolution and decay; in the great city of London they were only scanned for their possessions; assessed for any edge. Once upon a time, people looked and evaluated the face of a stranger, nowadays they first noted clothes, handbag and your wristwatch when you get to the top of the queue in McDonald’s on a Saturday night; perhaps your shoes as you walked away. All of those quotes come from the first 33 pages of the book and for the next 118 pages (roughly 24 hours in the narrative) Warner embarks on a writing excursion that is amusing, perceptive and shows a remarkable understanding of international airports. The girls spend that night getting drunk; the conceit of most of this section is that next day a hungover Manda can’t find her passport so they spend it wandering around Gatwick and a number of the hotels that surround it. Camps and sub-groups amongst the six form, dissolve and reform by the hour — a number of different bars are visited. For readers who have travelled, Warner uses this backdrop to observe the phoney pubs and bars, fastfood outlets, trinket shops and apparel outlets that comprise the sterile, self-contained world of the modern airport. Parts of it are hilarious, parts bring up not-so-nostalgic airport memories and parts reflect the inevitable boredom that is a part of travel. For me, it worked. The problem is that The Stars in the Bright Sky isn’t 151 pages long, it is 394. And after page 151, virtually nothing happens that isn’t a version of something that happened before (well we discover Ava’s secret, but it is entirely predictable). The characters don’t change — they just play out variations of their flaws and strengths (much more of the former than the latter) in new permutations. Having done such a great job of establishing the empty airport world in the first third of the book, there isn’t much to be added in the last two-thirds. Manda, dominating and interestingly irritating in the early part of the book, becomes mundane and boringly irritating (still dominating) for the rest. If you find yourself with a long wait in an airport, luggage that has no room for anything else and in need of a book to pass the time but worthy of being left behind in the lounge or on the plane, by all means invest the 13 pounds in Warner’s book. I can confidently say that while you wait for your flight to be called, you can look up from the book every five or 10 minutes and find the scene you just read being acted out across the room (okay, you probably have to be in the pub for much of that to happen). And I can equally assure you that if you leave the book behind when you reach page 151 you will not have missed a thing. As to how this book got onto the Booker longlist, I sure hope whatever judge or judges advocated it will do some newspaper piece somewhere and explain why. Despite the positive parts that I could find, the idea that this is the “best novel” of 2010 is completely beyond my comprehension.